Ionizers or Negative Ions Why o3ozone? The health and safety of ozone gas: IS IT SAFE TO USE OZONE ? ANSWER: Ozone, sometimes called "activated oxygen", o3, contains three atoms of oxygen rather than the two atoms we normally breath. Ozone is the second most powerful sterilant in the world and its function is to destroy bacteria, viruses and odors in nature. Interestingly ozone occurs quite readily in nature, most often as a result of lightning strikes that occur during thunderstorms. In fact that "fresh, clean, spring rain" smell that we notice after a storm most often results from natures creation of ozone. Ozone is also created by water falls. However, we are probably most familiar with ozone from reading about the "ozone layer" that circles the planet above the earth atmosphere. Here ozone is created by the sun's ultra-violet rays. This serves to protect us from the ultra-violet radiation. Additionally, each of us is exposed to high levels of ozone sometimes daily for short periods of time. This happens in heavy traffic conditions or during times when the weather forces ozone to remain lower to the ground than is otherwise normal. The combination of these two factors can result in ozone readings as high as 4 or 5 times the "regulatory" levels for continuous exposure with absolutely no adverse affects as our exposure is for such short periods, and the ozone itself decays back to normal oxygen so rapidly. QUESTION: Which is better; UV (ultraviolet) Ozone Generation or Corona Discharge? The Biggest difference between corona discharge and UV ozone generation methods is that UV ozone generators have stable ozone output levels throughout humidity ranges, while the output of corona discharge ozone generators is significantly reduced by just moderate humidity levels such as 40�70% (ozone output is reduced by approx. 40-70% with 40-70% humidity). In addition, with UV ozone generators, the cleaning requirement is almost eliminated compared to corona discharge ozone generators. Also, the ozone produced from a UV ozone generator is cleaner (no nitric acids) and smells better than ozone produced from corona discharge machines, and is just as powerful and often more powerful as ozone produced by corona discharge ozone generators. Please see our Ultraviolet (UV) vs. Corona Discharge ozone generation page for more information. QUESTION: HOW DOES OZONE WORK? ANSWER: While ozone is very powerful, it has a very short life cycle. When it is faced with odors, bacteria or viruses the extra atom of oxygen destroys them completely by oxidation. In so doing, that extra atom of oxygen is destroyed and there is nothing left...no odor...no bacteria...no extra atom, only oxygen. In addition to the effectiveness of ozone, we also know that it is safe to use. We know this from our own safe exposures daily to ozone, Whether, as noted earlier, resulting from being locked in traffic, or passing through industrial areas. These exposures have no effect on us. beyond our acknowledging the smell associated with ozone. It is the strength of this smell that provides ozone with it's "built in" safety mechanism. Ozone is safe because we notice it's smell at very residual levels. By residual we mean, the amount of ozone that is produced in excess of the required amount to eliminate whatever contamination that may be present in the room. This equipment, when used correctly will not exceed government guidelines for continuous safe exposure. Even if used incorrectly, ozone provides its own protection, as ozone warns us in a manner similar to smoke in a room. Ozone does this by becoming so offensive (a strong bleach-like smell) at 1.5 parts per million that we would not be able to stay in the environment for any more than a short period. This is much like what would happen if we entered a smoke filled room. However, while smoke might harm us, research has proven that a limited exposure to a low level of ozone would have no serious long term affect on us just as it does not affect us when caught in a traffic jam during rush hour. QUESTION: HOW IS OZONE PRODUCED? ANSWER: There are basically two methods of producing ozone...ultra-violet and corona discharge. Most equipment uses the corona discharge method, simulating in essence, lightning. Equipment utilizing UV was hard to find in the past because it was inefficient, expensive to operate, unreliable, and very costly to service compared to the corona discharge equipment available. In recent years the UV technology has improved significantly making it a viable alternative to the corona discharge systems and the preferred choice for remediation professionals. QUESTION: HOW LONG DOES THE OZONE LAST? ANSWER: As soon as ozone is formed in the generator and dispersed in a room some of it decays back into oxygen. This step occurs by several processes including the following: Natural decay (or revision to oxygen) due to ozone chemical instability. Speeding up of the above process by the presence of such as walls, carpets etc. stimulating the decay process. Oxidation reaction with odor causing organic material, which removes ozone. Reactions with bacteria etc., which again consumes ozone by oxidation reactions. Additionally ozone itself has a half life which means that "residual" ozone created (extra unneeded ozone) will return to oxygen within at most 30 minutes, in amounts equal to half its level. What this means is that after each subsequent 30 minute period there would be half as much residual ozone left at the end of the period as was present at the beginning of the period. This is similar to a geometric progression of 16;8;4;2;1. In practice the half life is usually less than 30 minutes due to temperature, bacterial, and other contaminants in the air. Therefore, ozone while very powerful doesn't last long...just does it's job and disappears. QUESTION: WILL THE ODOR COME BACK? ANSWER: No. If ozone is applied properly it destroys (oxidizes ) the source of the odor. However, in the case of mildew the odor will return if you are unable to get rid of the moisture that is the source of the mildew. QUESTION: HOW DOES OZONE HANDLE TOBACCO SMOKE? ANSWER: It eliminates the irritation caused by phenol gasses, by oxidizing them. Phenol gasses are the invisible part of tobacco smoke that causes such discomfort to one's eyes and create the offensive odors. Ozone rids any environment of the effects of smoke completely, rather than merely filtering out some of the visible particles like an "electronic air cleaner". ANSWER: No, ozone will not remove the stains or nicotine build up. Ozone will deodorize and help to decontaminate the problem but will not remove the actual substance. QUESTION: CAN OZONE BE HELPFUL IF THE CUSTOMER PURCHASES CRYOVAC'D BEEF? ANSWER: Yes. If the premises where meat is hung, cut and eventually cryovac'd, are treated with ozone, then this meat will be virtually contamination free as it is being packaged in the cryovac. And will consequently retain its good looks and stay fresh much longer before being sold or used than meat packed in an ozone free room where both odors and bacteria count will be high. Treatment of coolers and cutting packaging rooms with ozone ensures not only a contaminant free environment, but also a clean smelling room that customers and employees alike associate with a caring and progressive management. UV PRO 550 *popular, Professional Ozone Generator. This is one of the best for Commercial Ozone Applications / users! See the fully adjustable HVAC UV 560 Duct mounted ozone generator air purifier for permanent installation. Ozone is very possibly the most powerful and effective eliminator of smoke and odors. Ozone Eliminates tobacco smoke, its impurities or Phenol gasses, and odors from cooking, pets, mold, mildew and often the sources of household odors. Disinfecting and purifying with ozone provides a much healthier home, atmosphere and environment. Popular units for general household uses include the DC PRO 450, DC PRO 970, UV PRO 550, UV PRO 550AT, UV PRO 1100AT, UV PRO 2800 ozone generators. Also See the fully adjustable HVAC UV 560 Duct mounted ozone generator air purifier for permanent installation. For serious conditions, we recommend shock treating with one of the following: UV PRO 550, PRO 5000, PRO 9,000, UV PRO 2800, UV PRO 4000, UV PRO 6800. Please call to size the ozone generator correctly if you are not sure. 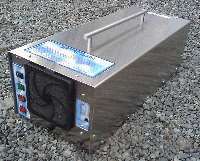 Ozone generators are particularly used by hotels and restaurants which have high standards of hygiene and health. Hotels and restaurants will find a portable ozone generator invaluable for performing deodorizing functions where nothing else would work. Ozone units are used for various areas in the hotel including the kitchen, lounge, bars, bathrooms, rest rooms, offices, bedrooms and garbage rooms. Customers that react negatively with chemical deodorizers will appreciate the "hypo-allergenic" non irritating environment ozone creates. Clean-up time for a problem room is shortened with the use of an ozone generator. Turn a room with a bad odor into a fresh new smelling odor free room often in less than 20-60 minutes! This will allow rooms to be in service much faster. Rooms will stay fresh and customers will appreciate the fresh odor-free room that ozone creates. Also, use of an ozone generator, will disinfect the air and surfaces, reducing the risk of bacterial, viral and other infections. Ozone is proven to be an effective way to reduce room cancellations from odor complaints. The UV PRO 550, UV PRO 550AT, UV PRO 1100AT, UV PRO 2800, UV PRO 4000, and UV PRO 6800 are chosen for these tasks based on how quick/ often the treatment is required, and how large the rooms / areas are. In homes, veterinary Hospitals / clinics, offices and kennels, ozone can take care of odorous surfaces and make the presence of animals hardly noticeable. Using "shock treatments" ozone can remove offensive pet odors. Disinfecting pet areas with ozone kills mold & bacteria and this creates a healthier environment for pets, their owners, Hospitals, and Kennels. (Note that ozone shock treatments should not be done with pets or people in the room) Again, the UV ozone generator models are best - include UV PRO 550, UV PRO 550AT, UV PRO 1100AT, UV PRO 2800, UV PRO 4000, and UV PRO 6800 chosen for these tasks based on how quick/ often the treatment is required, and how large the rooms / areas are. These ozone generators are ideal for shock treatments. OZONE eliminates the irritation caused by phenol gasses, by oxidizing them. Phenol gasses are the invisible part of tobacco smoke that causes such discomfort to one's eyes and create the offensive odors. Ozone rids any environment of the effects of smoke completely, rather than merely filtering out some of the visible particles like an electronic air cleaner or air filter system. For restaurant, bar, or pool hall owners, these units have proven to be invaluable and help keep clientele coming back! Ozone Generators work better than "smoke eaters", ionizers or air filters for removing smoke & smoke odors. For Bar and pool room owners, we suggest the larger units - such as the UV PRO 2800, UV PRO 4000, or UV PRO 6800(includes standard output control switch set) - turning the ozone generator output down - this extends cleaning intervals significantly while giving shock treatment ability when needed. See the fully adjustable HVAC UV 560 Duct mounted ozone generator air purifier for permanent installation. Mold is a problem in today's damp or wet environments. Molds & mildew are the number one causes of allergic symptoms. Many harmful types of mold & fungus can be found worldwide. they grow in high-cellulose material, such as wood straw, hay, wet leaves, dry wall, carpets, wall papers, fiber-boards, some ceiling tiles, insulation, and more. This types are wet and may be slimy to the touch. This dangerous mold grows in medium to high humidity (55 % +). Even when dry, this type of mold can causes respiratory problems. Using an ozone generator, you can help reduce, control and many times eliminate mold growth in your business and home. See our mold page for a better understanding of professional mold remediation and how ozone generators are properly used for mold remediation. Professional Fire restoration companies regularly use ozone generators for the removal of fire & flood odors Fire and flood damage odors are the most difficult odors to remove. With a powerful ozone generator, these odors can be removed. Shock treating with high levels of ozone will remove the odor and allow the room to be habitable. Due to the strong oxidizing power of ozone it is an extremely useful tool in the field of fire and flood restoration. In a smoke and fire damaged building ozone will eliminate smoke odors in the carpets, curtains, wood, cupboards, clothing, etc. In a flood damaged building ozone can be used once all the moisture has been removed. The ozone will eliminate musty odors and prevent growth of fungus, mold and mildew. Ozone is a much more economically viable option to restore fire and flood damaged buildings than any other conventional treatment method. See our mold page for a better understanding of professional mold (and smoke) remediation and how ozone generators are properly used for mold and smoke remediation. Ozone effectively deodorizes cars/automobiles, boats, trucks, vans, busses, and work vehicles. In addition to deodorization, ozone also kills germs that lurk on surfaces. Ozone permeates the fabric of the boat and car interior, neutralizing the bacteria responsible for unwanted smells. Therefore, ozone doesn't mask the odors, but oxidizes and kills the cause of the odor. Ozone generators can be used in the car or boat to prevent hay fever, and kill the smell of cigarette smoke and mustiness from damp upholstery. Car valet companies use ozone units to deodorize and disinfect cars. Portable units can be used to perform a "shock treatment" to eliminate odors. Another large market for ozone generators is second hand car dealers as well as car rental agencies. Ozone will also stop and prevent the growth of mold, mildew and fungus. Ozone ruptures the cell membrane of organisms such as mold, mildew, spores, bacteria and fungus, thus killing them. The ozone shock treatment eliminates odors permanently, providing the contamination is not reintroduced. Ozone also oxidizes diesel, carbon monoxide and other chemical fumes. Ozone proves to be invaluable for use in auto sales and restorations. With ozone shock treatments, vehicles smell fresh and clean. A fresh and clean smelling vehicle will sell faster and bring more profits after an ozone shock treatment. While small ozone generators can shock treat cars, if you are in the Auto Detail business, more ozone is required for super quick or thorough results. We suggest the UV PRO 550, UV PRO 550AT, UV PRO 1100AT, or the UV PRO 2800 for ultimate speed. The UV PRO 550 can treat a vehicle within two hours for most contamination types; an excellent choice! Critical professional applications such as animal, death scene biological recovery/ clean up and odor removal companies choose a powerful ozone generator - the PRO 9,000, UV PRO 2800, UV PRO 4000, and UV PRO 6800 for this "extreme" odor and biological contamination removal. See our Endorsement from a reputable bio-recovery training center. One of the most inviting environment for the incubation of any kind of bacteria are those places where little ventilation exists, where the temperature is warm and a certain degree of humidity prevails. In classrooms and on school buses the combination of groups of people, the heating system and perspiration on bodies and in the atmosphere pave the way for the best conditions for bacteria and micro-organisms to multiply. The application of ozone in schools deodorizes the environment and regenerates oxygen resulting in a completely clean environment free of bacteria, micro-organisms and odors. We suggest the PRO 5000, PRO 9,000, UV PRO 2800, UV PRO 4000, UV PRO 6800 machines. Boats often develop strong fish odors, bacterial, mold, and other odors. Ozone is excellent for removing and controlling these odors. Cruise ship companies can use ozone generators for room decontamination and odor removal just as hotels and motels. Dust mites are destroyed with ozone shock treatments! Insects and vermin are stay away from high levels of ozone. Ozone helps to remove their odors and keeps them from returning. Ozone is also used in attics to help keep rodents, birds, squirrels and other insects out. For example, a cockroach finds food and their home by the sense of smell. An ozone shock treatment can kill the odors of not only the food location, but of the cockroach's home. It is known that cockroaches will not leave their home if they cannot smell their way back. Also, if they smell no food, they're not interested! Indoor air pollution, or "sick building syndrome," is now a foremost health concern for even newer buildings today. For newer buildings, the condition is created by the application of energy efficiency in the construction of buildings, and work places. Many of these buildings are sealed better than before and do not have enough ventilation to provide enough fresh air exchange. With an ozone generator, this condition and contamination can be reduced or eliminated which creates a safer, healthy indoor atmosphere. Hotels, Motels, Restaurants, Bars, lobbies, beauty shops, dry cleaners, and all enclosed public areas can be decontaminated from odors by destroying the odor source with ozone. Customers enjoy a healthier, odor free environment when in an establishment that uses ozone. See the fully adjustable HVAC UV 560 Duct mounted ozone generator air purifier for permanent installation. Unhealthy air in air-conditioned buildings and homes is an international issue that continues to worsen. Governments recognize that certain air contaminants cause wide spread discomfort, absenteeism and reduced productivity. Airborne microorganisms have been demonstrated to be the leading cause of problems such as BRI (Building Related Illness) and SBS (Sick Building Syndrome). Ozone has gained a rapid reputation for improving indoor air quality and preventing BRI. Ozone gas is widely used to treat ventilation ducts using two methods. Periodic duct cleaning and continuous duct dosing. It is ideal for air conditioning ducts and heating ducts, found throughout residential, commercial and industrial buildings. Ozone duct dosing is suitable for residential and office buildings, hotels, clubs, hospitals, animal holding facilities, etc. Dosing the air conditioning system will reduce odors and harmful micro-organisms in the space being ventilated, as well as preventing micro-organisms from growing and multiplying within the duct itself. The use of ozone can reduce power consumption and system costs by 30% due to less make up air required (cleaner re-circulated air) and lower pressure drop (due to less mold on filter and condenser coils). The equipment suggested are the adjustable generators such as the DC PRO 450, PRO 700, DC PRO 970, and the two new UV ozone generator models, the UV PRO 550AT or UV PRO 1100AT are ideal. The "AT" stands for Adjustable with 48 hour Timer. These models produce the cleanest and sweetest ozone ever possible - adjustable down to very low levels or high levels for shock treatments and are much more dependable than corona models on the market! Please call 330-497-6900 for information or to purchase. 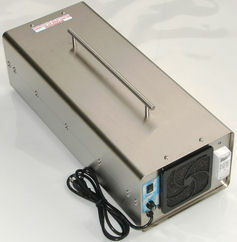 Also see the fully adjustable HVAC UV 560 Duct mounted ozone generator air purifier for permanent installation. Just as Hotels and Motels use ozone, you can bring your own to suit your needs. If the room you are in is desired, and there is an odor issue - then no more having to change rooms from an odor problem! Popular units for travel uses include the DC PRO 450, PRO 700, DC PRO 970, and the 3400 series ozone generators. Hydroponics or greenhouse companies often use ozone to create a growing environment inhospitable to molds, viruses, bacteria, & bugs, resulting in better, healthier growth, and higher profits. Plants can grow faster and healthier with the correct application of ozone. Another significant effect is the reduction and elimination of the odors often associated with a hydroponics facility. See the fully adjustable HVAC UV 560 Duct mounted ozone generator air purifier for permanent installation. UV ozone generators with adjustable ozone output, two new models, the UV PRO 550AT or UV PRO 1100AT are ideal. The "AT" stands for Adjustable with 48 hour Timer. These models produce the cleanest and sweetest ozone ever possible - adjustable down to very low levels or high levels for shock treatments and are much more dependable than corona models on the market! Please call 330-497-6900 for information or to purchase. Larger areas can use the UV PRO 2800, UV PRO 4000, or UV PRO 6800(includes standard output control switch set) with plenty of shock treatment ability when needed. Ozone is now approved by the FDA for use in meat and vegetable food packaging / processing plants (and other foods) for more thorough cleansing of fruits, vegetables, other fresh produce, and meats. Ozone has a variety of uses for hygiene and sanitation, and is well suited to a funeral parlor. The use of ozone shows an important progression in the field of disinfecting, sterilization and deodorization because it is a natural oxidizing gas, which uses no chemicals and leaves no dangerous chemical residue, making it the most healthy and effective alternative to chemicals. Because ozone oxidizes bacteria and viruses, it kills the organisms, which are responsible for causing unpleasant odors. Ozone is very effective for use in the mortuary for this reason, and also slows down the rate of decay and provides a more sanitary atmosphere in which the staff may work. All different sizes are used based on the desired use and odor control. Air purification is recommended with the DC PRO 450, PRO 700, DC PRO 970, and the 3400 series ozone generators.